This is a lager I've had a number of times before. It becomes available very sporadically in Melbourne, often there is a large influx of stock across many stores and then nothing for months. From my memory it's a pretty decent beer. I've been looking to review this for a while, but as outlined earlier the stock problems got in the way. Melbourne Victory had two soccer players from Costa Rica last year one of which, Jean Carlos Solorzano, helped me out with this glass and a different one from the same brewery, which arrived in the months while the beer was away. Now the beers back, let's drink some! Imperial pours a lovely straw gold colour. It's very clear and has a brilliant white two finger head on top of the beer. The head retention is poor, as you can see in the photo it's already subsiding quite quickly. There doesn't appear to be much carbonation at all in the beer and this is reflected by the lack of retention and lacing. Still it's better looking than many other tropical beers. Costa Rica's national lager has a very clean smelling nose, the pale malts seem pure and although they are weak the hops have a very nice aroma. The hops appear to be of a floral variety and although weak smell slightly spicy and seem like they will provide some bitterness. This beer gives off the feeling of quality, I hope the taste can live up to this simple yet pleasant nose. As far as flavour goes Imperial is pretty mild. The malts are quite weak and there aren't a heap of hops present. The hops that are there are of both floral and citrus varieties and just about enough bitterness to balance the beer. Towards the back of the palate a spicyness, that I believe is from the hops, helps to leave a lovely dry finish in your month, it's excellent! I'd be more than happy to drink this not just in Costa Rica but anywhere, this lager stands up to many worldwide. 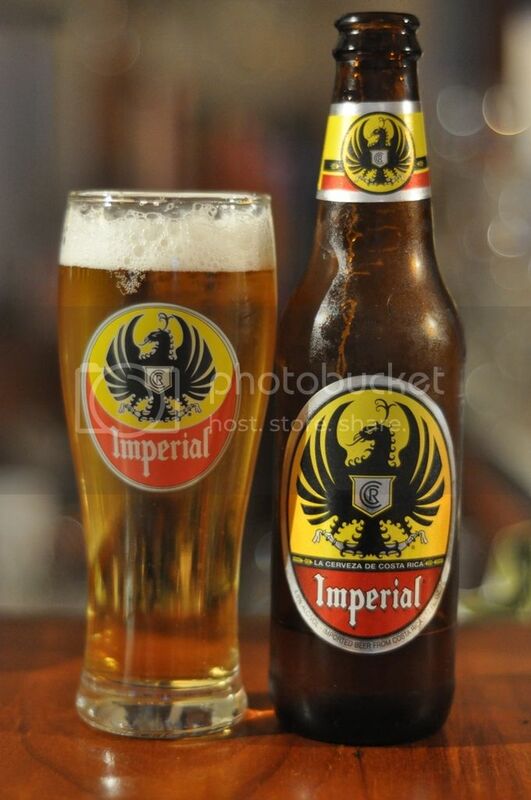 Imperial is a solid, easy drinking lager. It's ingredients seem to be of quite a high quality and the flavour is excellent all-be-it mild. This would make a fantastic session beer, the carbonation is low and it stands up to European lagers in terms of flavour and price. I would recommend this lager to all who like lagers, it's got nothing that really makes it stand out from the pack but it's drinkability is excellent. If you were to get a case of this and watch the footy with some mates, it would be the perfect beer. I've been looking for Imperial for a while. I drank a lot of it when I was in CR a few years ago. Any idea if it's available anywhere in Melbourne at the moment? Not sure at the moment Nick. I'd try Acland Street Cellars; if they don't have it you can always try the importer - http://www.apexports.com.au/contact/ Good luck, let me know if you find any.